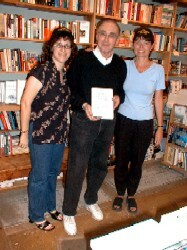 Bob, Amy Madnick and Kati Taurs merge for a third-year-visit photo at Village Books in Palos Verdes, CA, among the friendliest and most neighborly stores around. This year's appearance included a chance to see the fantastic mural by well-known artist John Robertson hanging in the window. Kati Taurs has John doing portraits of most of the authors who come visiting. 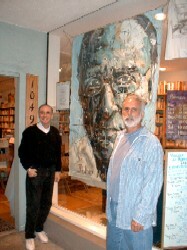 That's John with Bob, and, you bet, the mural is now hanging in the Levinson abode. Thank you, John. 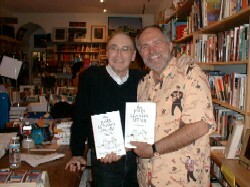 A surprise among customers on hand for Bob's appearance was an old pal from the music industry, promotion genius Don Whittimore, whose years at RCA included close involvements with The John Lennon Affair "co-star," Harry Nilsson, and from an earlier Bob book, The Elvis and Marilyn Affair, the King himself. Don is "Dandy Don" nowadays, one of the Greater Los Angeles area's leading purveyors of homemade ice creams. 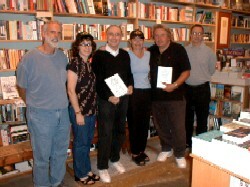 Bob, Amy and Kati are joined by others for a group shot. Thanks one and all, says Bob, for another wonderful evening.